Take a look at the cover – along with CNN producer, Josiah Daniel Ryan’s tweet stating that this is “the future of media” – and see if you can guess what’s missing. If you guessed “there are no women” you would be right on. In fact, The Hollywood Reporter and CNN are currently being trolled online for this absurd omission. The cover shot includes news anchor Jake Tapper, YouTube star and CNN’s recent hire Casey Neistat, CNN President Jeff Zucker, CNN host W. Kamau Bell, and chef-turned-host Anthony Bourdain. Now, the actual article is something every PR pro should read as it details coming shifts in the news media with a greater focus on competing with edgier in-depth news outlets like Vice and infotainment news like BuzzFeed. I’m frankly surprised they excluded “Out Front” host Erin Burnett as she is the only female anchor in CNN’s primetime lineup, not to mention the scores of other women who lead media stories in front of and behind the cameras every day. When Ryan tweeted the cover with the comment “the future of media looks like this,” folks on Twitter were quick to set him straight. What do you think? Was this a simple omission or does it illustrate a greater problem of inequality in our newsrooms? It’s just business as usual. None of them noticed there were no women on the cover because none of them notice the lack of women in the board room either. It’s one article. Why does everything have to be equal? 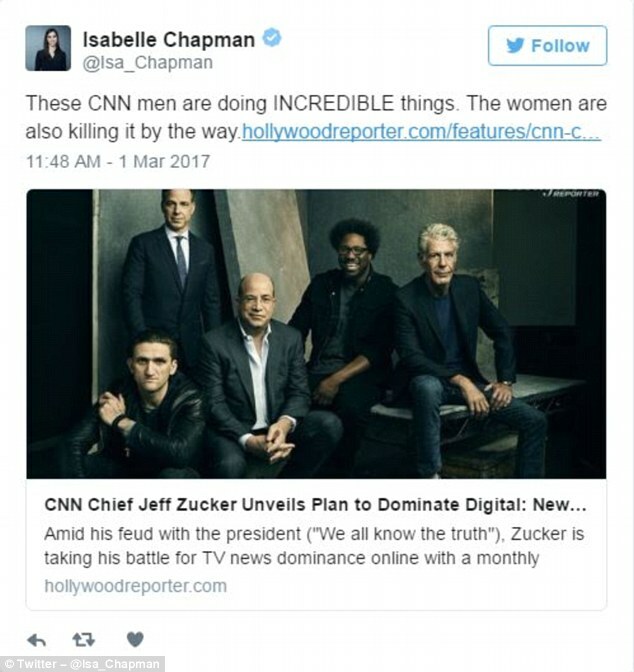 It really is incredible that CNN didn’t think to include a single woman in this cover! I can’t wait to see how they backpeddle their way out of this one.